Did A Trump Aide Just Admit To Assaulting A Reporter? I’m trying to remain objective about the following story, despite my complete disdain for Donald Trump and the fact that I know and like two of the people involved. One of them works at the Daily Caller, and the other one used to. I consider them both friends, and I believe them. So far there’s been no official confirmation or denial that it was Lewandowski, and it’s too late for any apology to be considered immediate. Ask yourself: If you told your employer that this had happened to you, is this the response you’d want to see? “Someone” allegedly did it. Okay, it’s a press scrum, things get hectic. I get that. But she was told it was Lewandowski by someone who was standing right there. Response: “If that’s the case.” Why wouldn’t it be the case? Are they saying their own employee made it up? And what are they going to do if Lewandowski doesn’t apologize? Lewandowski’s explanation to Boyle, said these sources, was that he and Fields had never met before and that he didn’t recognize her as a Breitbart reporter, instead mistaking her for an adversarial member of the mainstream media. “I only assaulted her because I didn’t realize she worked for Breitbart” is not a good answer. Okay, this is according to anonymous sources, so take that with as big a grain of salt as you want. But now Boyle isn’t talking. Nobody else at Breitbart is talking. Nobody in the Trump campaign is talking. Do any of them seem like the type to keep quiet about a story that reflects badly on them? Trump henchman allegedly manhandled a female reporter, who works for fox. will that come up? "Obama flack physically abuses reporter" would lead the news. Just a thought. 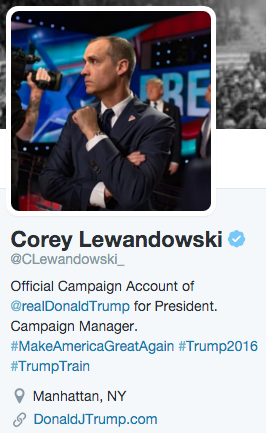 What's litmus test for jerking ppl to the ground, @CLewandowski_ ? If you didn't know they were from a site in the tank for you then NOT OK? Just two weeks ago, Ted Cruz fired his comms director for retweeting something. Now a Trump aide is accused of assaulting a woman in public because he didn’t realize she worked for Breitbart. And it sure seems like they all just want it to go away. Trump needs to address this right now, because it’s not going away. Maybe the guys in charge at Breitbart don’t care what happens to Michelle Fields, but a lot of other people do, and we’re not going to shut up about it. Either confirm or deny that Lewandowski did this, Mister Trump. If he did, you must fire him immediately. Update: Michelle Fields responds. I’m trying to make sense of it. She confirms the story, but then asks everybody to move on. It’s very strange. Update: Rick Wilson is a GOP consultant who has publicly criticized Donald Trump and felt the wrath of Breitbart for it. 5/ in which Trump's most senior advisor attacks, man handles, and bruises a reporter imposes a moral obligation on their organization. 6/ Their conditional, almost fawning response was a tug of the forelock, practically apologizing for offending Trump. 7/ What would Breitbart do if Rubio campaign manager Terry Sullivan had attacked @MichelleFields? Days of endless, incandescent coverage. 9/ …reporter to shut up. Breitbart's famously restrictive noncompete agreement probably makes it tough for @MichelleFields to leave. 11/ …most vocal and obsequious boot lick. They're not tough guys. They're not crusaders. They're not fighting a #war. 13/ …then you're not doing journalism. You're stenographers. Sorry for the typos in that little rant. It's so cold in this hotel room you could hang meat in it. Update: We now have a denial. And the real victim. Where’d he go? Did something happen? Did something not happen? I’m being told that she shouldn’t complain because the bruises are so small. No, the bruises should not exist. And now this creep is calling her a liar.